Premultiplies the channels with the alpha value of the layer, resulting in an opaque layer. This is helpful when creating layers used by other effects, or in certain compositing situations. Use this option if you are importing a semitransparent image. 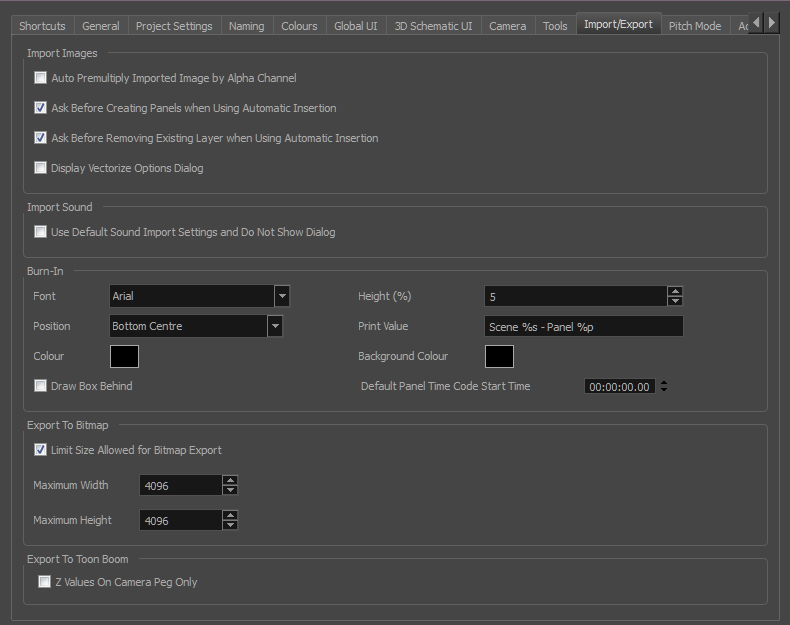 Deselect this option if you are importing a PSD image. When using the Storyboard > Import Images as Scenes command, if the element you will create upon import does not already exist in your project, you are prompted to create the element. When using the Storyboard > Import Images as Scenes command, if the element you will create upon import does already exist in your project, you are prompted to remove the original element or keep it. Opens the Vectorize Options dialog box when importing bitmap images. Prevents or allows the opening of the import sound file settings dialog box when importing a sound file. When selected, the settings dialog will not open, and default settings will be used. When deselected, the settings dialog box will open every time, and allow you to adjust settings every time. Lets you select the font in which you want the timecode to print when using the Export > Movie command. This menu lists all the fonts available on your system. Sets the position rule of the timecode of your animatic: Top Left, Top Centre, Top Right, Bottom Left, Bottom Centre, Bottom Right. By default the timecode will print in black on your animatic. Click the colour swatch to open the Select Colour dialog box and select the colour of your choice. Places a colour rectangle behind the timecode. This can be useful when you have a colourful or high-contrast animatic and you cannot easily find a font colour that stands out against the images. Sets the height (in percentage) of the timecode font size. Click the colour swatch and choose a colour from the Select Colour dialog box that opens. This is the colour of the box that appears behind the timecode when the Draw Box Behind Time Code option is selected. Defines the default starting timecode for each panel when selecting the Print Panel Time Code option in the Export Movie dialog box. Imposes a size limit when exporting bitmaps. When this option is selected, you can define the size limit in the two fields below. When the Limit Size Allowed for Bitmap Export option is selected, use this field to set the maximum width (in pixels) the exported image can have. When the Limit Size Allowed for Bitmap Export option is selected, use this field to set the maximum height (in pixels) the exported image can have. Exports the camera with a Z depth value of 0; Z depth values are on the peg. This makes it easier to see the camera field value in the Xsheet. It is recommended to enable this preference if you will be editing camera moves from the Xsheet.